A former 165-acre camp and brownfield site will soon be transformed into a lush and restorative visitor’s center for the Blue Ridge Escarpment in Greenville, South Carolina. 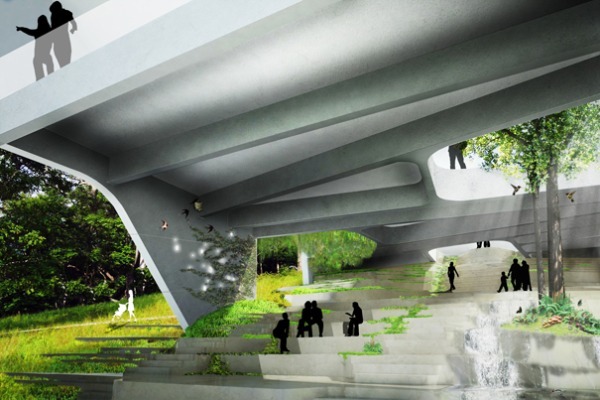 Studio Gang Architects is leading the design team that will create not only the visitor’s center, but transform the surrounding landscaping, which serves as an extension of the building. Once complete, individuals can enjoy and explore the naturally lit, LEED Platinum Blue Wall Center filled with “living exhibits” of the region’s flora, fauna, and geology and immerse themselves in the surrounding eco-system. The visitor’s center will be a dramatic cantilevered building built into the side of a hill and projected out over a small clearing. Large glass covered holes punctuate the building and pull light and nature deep into the interior. Rainwater is collected in order to demonstrate principles of conservation, and the entire project is aiming for LEED Platinum certification. Surrounding the Blue Wall Center is 165 acres of a former camp and brownfield area, which will be completely restored and developed with landscaped gardens, eco-lodges, hiking trails, and outlooks onto the Blue Ridge Escarpment. Studio Gang sees the landscape as an important element in this project and landscaping immediately surrounding the building will work to compliment the center with series of “garden rooms” designed to focus, magnify, and intensify the Escarpment’s subtle beauty. A former 165-acre camp and brownfield site will soon be transformed into a lush and restorative visitor's center for the Blue Ridge Escarpment in Greenville, South Carolina. 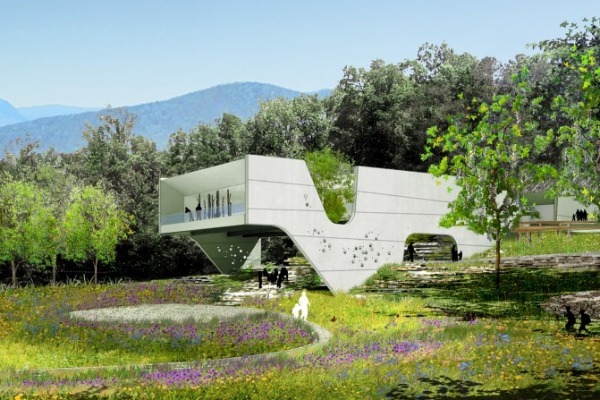 Studio Gang Architects is leading the design team that will create not only the visitor's center, but transform the surrounding landscaping, which serves as an extension of the building. Once complete, individuals can enjoy and explore the naturally lit, LEED Platinum Blue Wall Center filled with “living exhibits” of the region’s flora, fauna, and geology and immerse themselves in the surrounding eco-system.